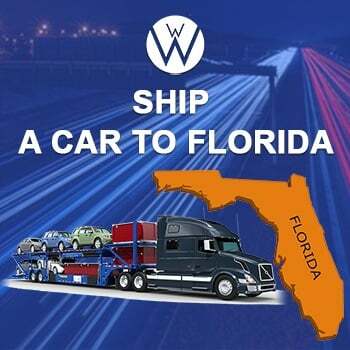 Ship a Car to Florida. Shipping cars to Florida, or any other state in the country, requires a company that has the right expertise and equipment. Whether you are shipping a car for sale or shipping your personal vehicle, you will need to have the confidence that the transport company you choose can offer a service that is affordable, reliable, and prompt. Choosing the wrong company can lead to a poor experience and you could even risk damage to your car. Why take a risk when you can rely on the best company when you Ship a Car to Florida? We Will Transport It Inc. is a transportation company that won’t let you down. If you need a private vehicle shipped, or even if you are shipping a fleet of vehicles, you’ll find an affordable solution that ticks all of the right boxes. WE WILL SHIP A CAR TO FLORIDA THROUGH OUR NETWORK OF LICENSED AND BONDED TRANSPORT FIRMS. How often have you paid for a service and received less than what you expected? It’s often difficult to narrow down the options, and many times people choose the first company that they find, without performing the necessary research. Ship a Car to Florida with the best Company in the market. A car is a significant investment with a hefty price tag attached. The wrong shipping partner could quickly lead to a situation where you regret your decision. When you choose We Will Transport It Inc. you will be able to take advantage of years of industry experience, backed up by the most trustworthy carriers in the country. We deal directly with commercial transporters, to make things easier for you. We take care of the contract and logistics, so you’ll only have a single point of contact to worry about. We can provide timely updates and answer any questions that you might have to put you at ease with the shipping service. Most importantly, we only use a network of licensed and bonded companies when we need to Ship Cars to Florida. This means that you are fully protected from any risk of financial loss. Peace of mind is important when you’re shipping a car, and we go to great lengths to ensure that you are satisfied from the moment your car is picked up, right up to when it reaches its destination. Ship a Car to Florida with us and save time and money. Best Florida Car Shipping Company in the US. WHAT IS THE AVERAGE COST WHEN YOU SHIP A CAR TO FLORIDA? Besides finding a reliable service to ship a car to Florida, you will also be concerned about the price to ship a car to Florida. Transportation is one industry where there is no set price, and this is for a number of very good reasons. Transportation methods can vary depending on the year, make, and model of a vehicle. Larger vehicles may require special shipping services to ensure that the job is completed safely and without incident. The largest cars may require special oversized trailers, as well as a pilot vehicle to accompany the main truck on the journey. Size and weight will always be a factor, so consider this when you receive your quote to transport car to Florida. The type of transport will also have bearing on the final quote. If you are shipping cars to Florida that are rare and expensive, then you may want a fully enclosed or covered trailer for transport. This will protect your investment on the journey, no matter what the weather is like. This type of transportation can cost more, but you will have a better piece of mind with your prized investment. Ship a Car to Florida with us. The season can also influence the price, and particularly busy periods can mean that shipping space is at a premium. In these cases, a price can be at a premium too. The constantly changing gas prices will also mean slight variations to pricing throughout the year. While you should keep all of these factors in mind, it is important to recognize that we will find the most affordable quotes to get the best shipping solution for your budget. As a shipping broker, we look out for your interests and will always work to negotiate the best deals. Because we have a network of hundreds of carriers around the United States, we can ensure that you always get the best deal, and there’s no need for you to spend time shopping around. Whether you are shipping the family car or a rare performance car or luxury vehicle, we’ll get a quote to ship car to Florida, while satisfying all of your special requests. What’s the difference between a good shipping company and a bad one? It’s all about the service when you Ship a Car to Florida! The best way to determine whether a service will work for you is to take a look at consumer reviews and see for yourself just how well a company can satisfy your requirements. At We Will Transport It Inc., we are proud to have one of the highest customer ratings in the industry. On Transport Reviews we maintain a 90.8% positive customer rating with an average of 5 out of 5 Stars. With the Better Business Bureau we have an A+ scorecard, with an average of 4.85 out of 5 Stars. If you want a car shipping company that not only claims to have the best service, but that is also rated by independent consumers as the best in the industry, then it’s time to give us a call. Ship a Car to Florida or any other state in the US, requires a company that has the right expertise and equipment. We Will Transport It will take care of you! We Will Transport It Inc. is a transportation company that won’t let you down. Transportation methods can vary depending on the year, make, and model of a vehicle. Larger vehicles may require special shipping services to ensure that the job is completed safely and without incident. The largest cars may require special oversized trailers, as well as a pilot vehicle to accompany the main truck on the journey. Size and weight will always be a factor, so consider this when you receive your quote to transport a car to Florida. On Transport Reviews we maintain a 90.8% positive customer rating with an average of 5 out of 5 Stars. With the Better Business Bureau, we have an A+ scorecard, with an average of 4.85 out of 5 Stars.